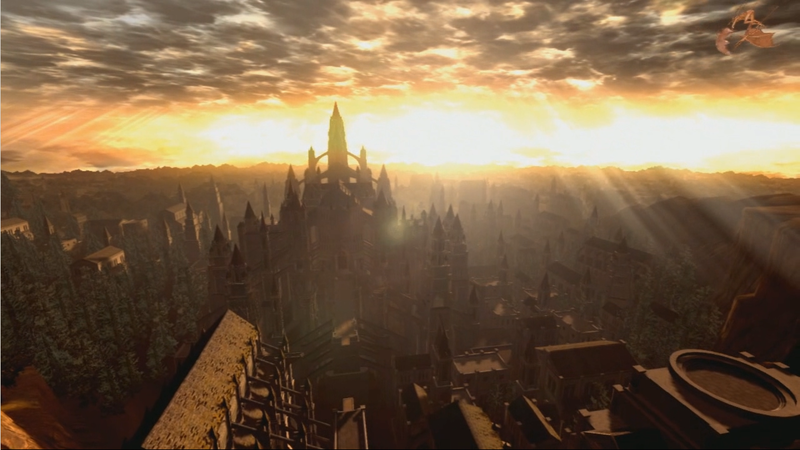 With its perpetually setting sun and gorgeous architecture, the city of Anor Londo will take your breath away upon your first sight of it, but don't be fooled by its seeming tranquility. It's reachable via a small orange ring that appears after defeating the Iron Golem on top of Sen's Fortress, and is the home of Lordran's remaining deities and the Lordvessel- an essential artifact for completing the main quest. Enter through the fog gate and to you'll be outside again. Continue across the bridge ahead you'll be at the top of a tower with a spiral stairs and a rotary lever. Turn the lever counter-clockwise and you'll see a cinematic showing that this staircase tower can rotate and move up and down. After the cut-scene ends you will have to fight another gargoyle. Once defeated, turn the lever counter-clockwise again so that the tower goes down further. Head down the spiral staircase now and over the bridge to a new room where you will find the Darkmoon Tomb bonfire and the Ring of The Sun's Firstborn. Note: The large statue at the back of the room hides a secret down staircase that will only open if you have the Darkmoon Seance Ring equipped. At the bottom of the stairs you'll find a spot where you can kneel before a fog gate and converse with Gwyndolin and be able to join the Blade of the Dark Moon covenant and/or take on Gwyndolin in an optional boss fight. So, if you've defied the odds and have already been to the Catacombs and gotten the Darkmoon Seance Ring, then go right ahead. Otherwise make a note of the area and move on - you can come back here later in the game once you obtain the Darkmoon Seance Ring. Do NOT enter the fog gate unless you wish to fight Gwyndolin. How to Enter Darkmoon Tomb by not killing the Dark Sun Gwyndolin ?